Today there are eleven Islands that are part of the Similan Archipelago. These eleven Islands are all part of Thailand’s southern Phang Nga province and are located in the Andaman Sea, at around 70 kilometers from the mainland of Thailand and Phang Nga town. The exact coordinates are 8°39′09″N 97°38′27″E which indicates that they are located close to the equator and enjoy a stable two season climate. In Thai the Similan Islands are called: หมู่เกาะสิมิลัน, Thai pronunciation: mù kɔ̀ si.mi.lan and in Malay: Pulau Sembilan سمبيلن ڤولاو. 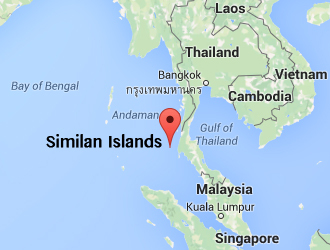 It means the Nine Islands but as of 2014 there are eleven islands that are part of the Similan Islands Archipelago. The map of the Similan Islands gives you an idea of the location and position of the islands. On the west you find the open Andaman Sea and the famous Andaman and Nicobar Islands, East is the inner Andaman Sea with Thailand in sight on about 60-70 kilometers away. In the north the Islands reach out to the maritime borders of Myanmar and the famous Mergui Archipelago. When you head south you will encounter Sumatra, which is an island of Indonesia. For more information on how to travel the Similan Islands please consult our getting there page. You can als find a map of the diving spots on this page. The islands are shaped with rough rocky coastlines on the West and sandy beaches on the East. Most of the Similan islands are rocky and have a few mountains on them. 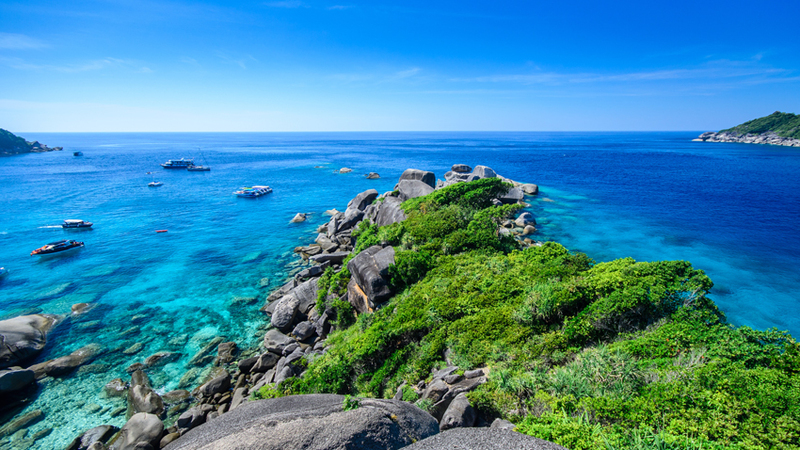 The highest mountain is 244 meters, which is located on Koh Similan Island. Not all the islands are rocky though; some of them have dunes of sand to give the flatness some elevation. The islands that do have beaches are perfect for relaxing since they all have crystal white, fine sand and beautiful warm and clear waters. Mainly shallow waters that are perfect for snorkeling surround the islands. In these shallow waters multiple famous rock formations and coral reefs can be found via snorkeling or diving. The most famous rocks are Elephant Rock, the pinnacles of Koh Tachai and Christmas point of Koh Bangu. 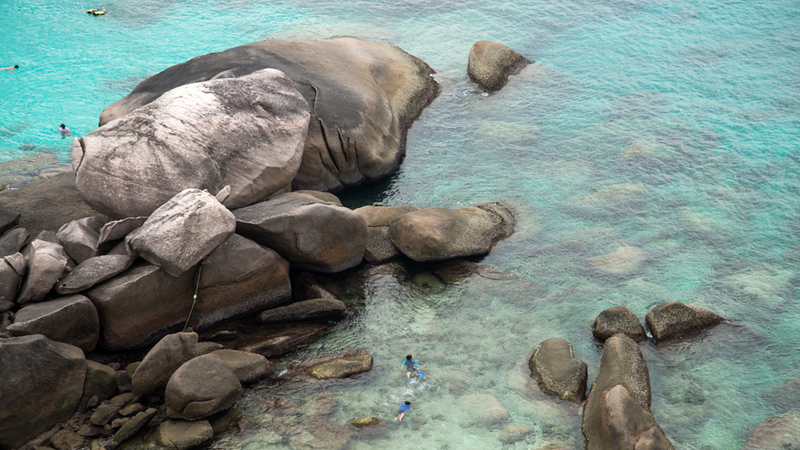 All the Similan Islands have been shaped by Mother Nature and show signs of erosion by the sea. The Tsunami of 2004 did a lot of damage to the islands and until today they are still in an endless battle with the sea. This is because they are facing the open Andaman Sea that flows over into the great Indian Ocean. 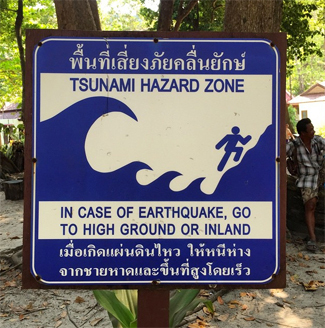 The 2004 tsunami destroyed some natural habitats such as the mangroves and other fragile eco systems. Nevertheless, nature is recovering and with the help of the Thai government the island is regaining its strength. 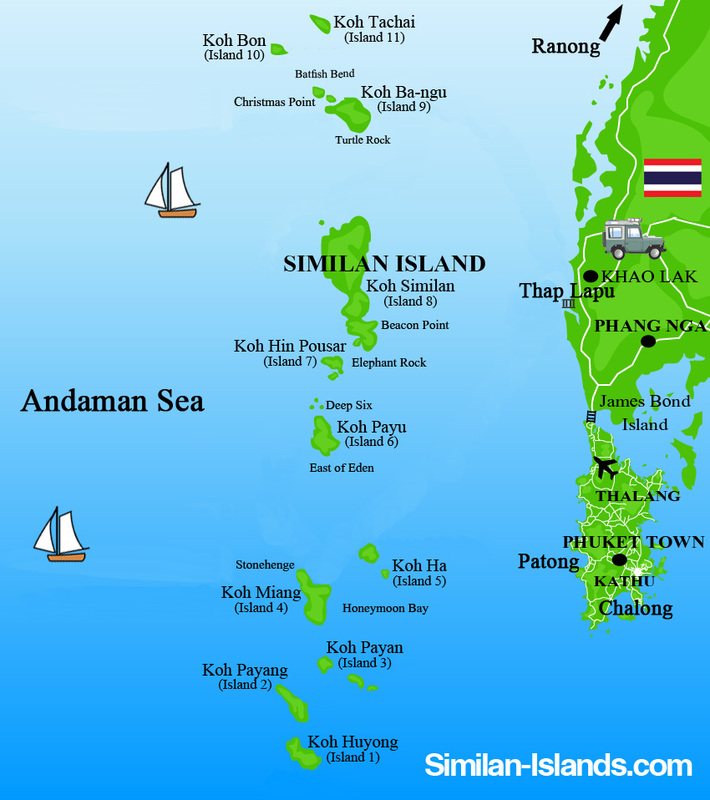 The island of Koh Tachai was renamed after the tsunami, it was first called Koh Bua after the lotus flower that grew in the mangroves/swamps of the island.